Featuring a fitness center as well as a garden, Kiboko Safaris is located in Kakumbi, within 1.3 miles of Jonda Bus Tours (Chipata-Lusaka-Mfuwe) and 2.7 miles of Zawa Head Quarters. The luxury tent has an outdoor pool. 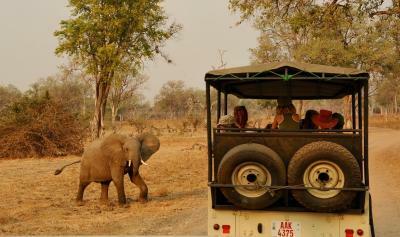 Norman Carr Safaris Zambia is 3.2 miles from Kiboko Safaris, while Viewpoint Luangwa river is 5 miles away. When would you like to stay at Kiboko Safaris? WiFi is available in public areas and costs USD 5 per 24 hours. House Rules Kiboko Safaris takes special requests – add in the next step! Kiboko Safaris accepts these cards and reserves the right to temporarily hold an amount prior to arrival. We need at least 5 reviews before we can calculate a review score. If you book and review your stay, you can help Kiboko Safaris meet this goal. No internet, but I'd rather call this an advantage. Amazing experience if you want the real African wilderness Liked it so much so decided to stay for longer. Great staff - 24/7 available, very nice to talk to, experienced and educated. Don't expect any luxury, because the nature is luxury itself! and hot water all time - that's unexpected in this part of the world! animals walking all around day and night - wonderful experience! Just sit and relax - don't ask for more. Good food 3 times a day + drinks in between And their game drives are great! if you're lucky you can see all animals you desire. Great set up bang on the River. Lots of wildlife going through the camp. Heinrich is a very knowledgeable host. I did not book a game drive which is an option to consider next time. Staff was fantastic!